Hi, my name is Jacqueline (Jacq) and I live in a secure, leafy house in Lilyfield surrounded by dog parks. I offer exclusive hosting as I understand not all dogs want to share with others and placing them into a strange home with strange animals can be quite stressful, so for this reason I offer exclusive one on one hosting (no other dogs/cats), so you can relax on your holiday knowing that you fur child/children are also having a stress-free holiday. Up until very recently I owned two dogs of my own Jock and Poppy who died within 6 months of each other due to non related old age illnesses. Both were 16 years old. I miss them greatly, their companionship and the walks we shared together. I loved my dogs and can't bear the thought of replacing them for a long time to come as they were my family. But I miss having dog company and 'walkies'. I very familiar with being around pets of all kinds. I am also an artist and specialise in animal portraits (see pictures). I work from home, so your fur children will rarely be left alone. They will receive at least two walks a day to socialise, exercise and have fun but never off the lead. Your dog/s will have run of the house and I place clean dog beds in various rooms, so your fur children can join me anywhere in the house. They will be brushed regularly and pampered! My premise is very secure (over 7 feet high fences), very safe and dog proof. It is a typical semi with small backyard with lawn. 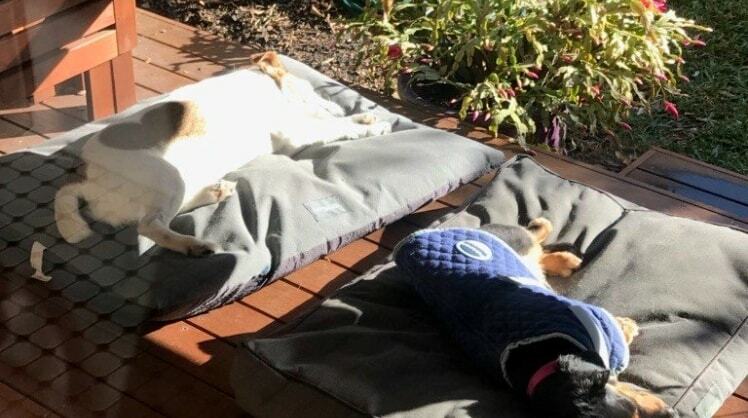 I find that as they get plenty of walks each day and spend most of their time with me for company they only go outside for the obvious or lazing outside in the sun (see photos). If you have any routines, feeding times, special diets, special needs, medication, special toys, lead only, no couch rule etc. I am happy to accommodate those. I let them sleep were they are most comfortable as that avoids any unnecessary stress and we all get our sleep! Pet Hosting / Doggy Day Care - includes at 2-3 walks per day, grooming, company 24/7. I will only take care of dogs that are not too strong on the lead i.e. pull the entire time and it takes effort to hold them. I can pickup/drop off if required within Lilyfield and surrounding suburbs for $5 each way e.g Balmain, Annandale, leichhardt etc. Other suburbs can be arranged for a little more. I can guarantee your dog will be treated like my own and may not want to go home! Jacq is an absolutely wonderful sitter. She’s always reliable, trustworthy and provides the best one on one care for our doggie. Her home is perfect for a doggie, with a dog door leading to a secure courtyard. Jacq spoilt our little one during her recent stay with two walks a day, plenty of food and lots of cuddles. We also received regular updates from Jacq which we really appreciated. Jacq is our favourite sitter and we’ll definitely be using her again. We feel so happy and lucky to have found Jacqueline. She took excellent care of our two dogs whilst we were away. They really miss her! The communication was perfect, it was comforting to get messages from Jacqueline with pictures of the dogs having a great time. I have grown up with animals all my life and know how to interact with them and sensitve to their needs.